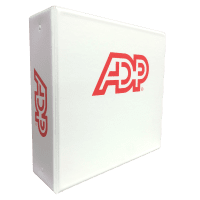 This heavyweight ADP 3-ring binder is ideal for protecting and delivering payroll reports, high-value documents, chart of accounts and general ledger. We also offer a selection of Presentation Products that your business uses every day: Pocket Folders, Envelopes, Labels, Business Cards and more. Create an impressive-looking presentation that will give your brand the image it deserves.